Despite the relaxing necessary this weekend I did want to post something food related. Don’t worry I am multitasking and breaking in my wedding shoes at the same time. Is it worrying that the word I most associates with shoes after 30 minutes is “ouch”! 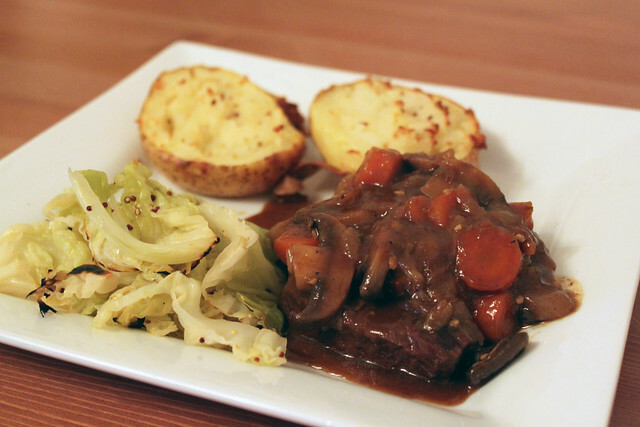 This braised beef dish is another great autumn recipe perfect for a Sunday evening. I got this recipe for Rich Braised Beef with Melting Onions from the October edition of Good Food, and it appealed to me as it was so simple and I had all the ingredients I needed. I love this type of Autumnal cooking, a little prep and then hours of great cooking smells wafting through the house. I won’t post the recipe for this because I made no changes. It is fantastically warm and homely the way it is. Perfect as the weather is getting just that tad colder this weekend.